← Maple Trees are Blooming……..
A bee tree found on a friend’s farm. They report it has been there for years. obvious that you want a good hand, however, you don’t know what cards are needed until the game is going and you find out what cards the other players are holding. With life the stakes are higher and sometimes the rules change in the middle of the game. Everything can be going along just fine, then a new pest, virus, bacteria or environmental factor can change everything. Nature’s way of building genetic diversity through survival of the fittest (and luckiest) has led every species on the planet to the point that we find them in right now. “A further challenge to the maintenance of a broad genetic foundation for breeding results from current large-scale queen production practices, whereby each queen “mother” is typically used to produce more than a thousand daughter queens. Overall, it has been estimated that fewer than 500 queen mothers are used to produce around 900,000 daughter queens annually for commercial sale in the US (Delaney et al. 2009). I can attest that feral bees are out there, at least in my area. Odds are good that they are in other areas as well. Evidently some good cards were already dealt and in play long before mites arrived here in the 1980’s. Yeah a lot of bees left the table, but some colonies evidently had good enough hands to keep playing the game. Even if you are dead set on ordering packaged bees maybe a little research and experimentation will surprise you. This year go ahead and order your packages, but also look into trying to catch some feral swarms via swarm trapping. I recommend Swarm Traps and Bait Hives by McCartney Taylor (http://learningbeekeeping.com/). It is a very basic book, and it will get you headed in the right direction. Also use this site as a resource. I will have material forthcoming on building swarm traps. Once you catch your first swarm you will be hooked. How much would you pay for a package of bees that was advertised to be treatment free and had a strong likelihood to have some nosema and varroa resistance? What if you could get them for free? 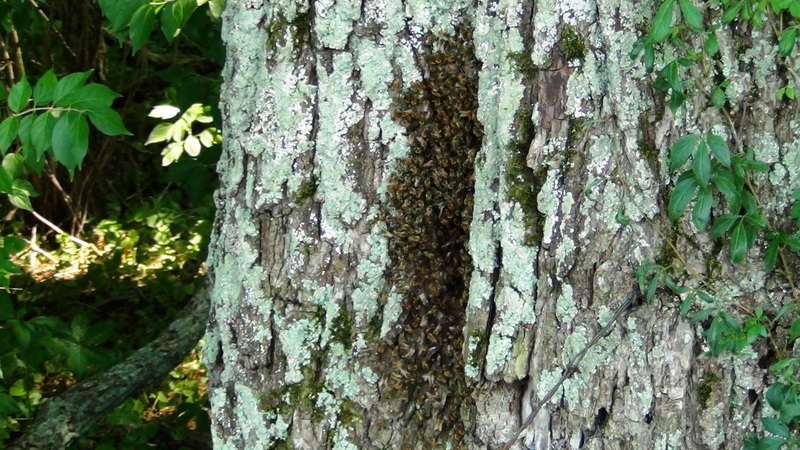 Remember, feral bees weren’t treated for ANYTHING, YET are strong enough to overwinter and swarm! With each feral colony you bring into your apiary you will be getting more potential wild cards helping you not only overcome known diseases and pests but maybe even ones we haven’t yet encountered. I don’t gamble but DEAL ME IN!!! What do you think? Leave me a comment or send me an e-mail. This entry was posted in Feral Bees, Posts, Swarm Trapping and tagged bee genetics, bee tree, beekeeping, feral bees, feral hives, genetic resistance, Jason Bruns, treatment free beekeeping. Bookmark the permalink. Good…. Run it past your prof. and see if it cuts the mustard! I will send you the trap-out information I have. I read the post and I strongly agree. Without a strong genetic diversity we will always have to babysit. The bees will be stronger and more robust as the gene pool increases(more wild swarms) and thier will be a great resistance to all the problems that we currently face. Preachin’ to the choir man. I sent you a couple of e-mails. Let me know if you got the second one. It was quite large (15Megs). If you didn’t get it I will mail you the attachments separately. Let me know.